About 1.5 million tonnes of debris from the Japanese tsunami is being swept towards western USA and Canada. Tom Heap asks what dangers it holds and how it can be dealt with. Since the Japanese tsunami 1.5 million tonnes of debris has been floating across the Pacific towards the West coast of North America. Despite predictions that it wouldn't hit land until 2013 ,some material including a ship and a 66 foot dock have already beached - far earlier than expected. 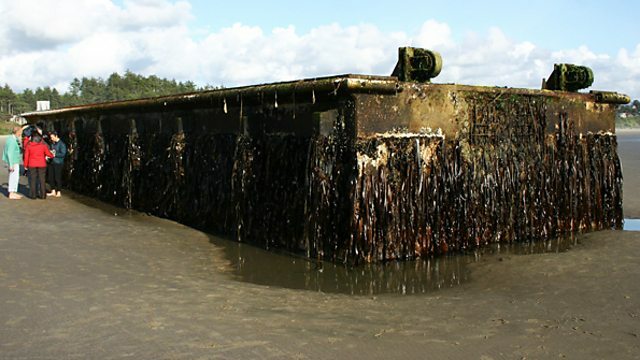 The dock itself - which landed in Newport, Oregon was covered in living creatures, including invasive species which could threaten native species and fisheries. It's also feared the debris could endanger wildlife that becomes entangled in or consumes it. As winter storms approach a new cluster of debris is expected. Tom Heap investigates what's being done to track it, what danger it poses, how it's being cleaned up and, in some cases, how possessions are being returned to their owners 5000 miles away. A selection of programmes from Radio 4 that are available to download for free.